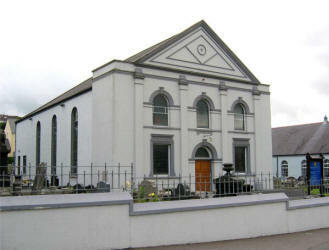 Banbridge Road Presbyterian Church, Dromore, built in 1841 and renovated in 1954. Notice Board at Banbridge Road Presbyterian Church, Dromore. A deputation of local people waited on the Secession Synod on 11th October 1836 asking for services to be arranged. This was done and the Seneschal of the time gave the use of the Court House. In December the Presbytery were informed that the Bishop had forbidden its further use and the Reformed Presbyterians accommodated the new congregation. A committee of Presbytery took charge and in July 1837 a site was sought and ultimately promised, but it was not available until May 1838. In the interval £100 was raised and building started on 22nd August 1838. Progress was slow. Money was insufficient and the Presbytery had to come to the rescue. The cause was weak and lacking enthusiasm, and even in July 1840 at the union of the Synods it was still unfinished. The united Church body decided to pursue with the idea of a separate congregation and the meeting-house was completed, and on 7th March 1843 the first minister was called. There had been a Rev. John Allen working here at the start and old newspapers indicate him as the first minister. Whatever his status, he resigned in 1843 and Mr. John McKee (lic. Dromore) was ordained on 7th March 1843. During Mr. McKee’s ministry the manse on the present site was built, on ground provided by the McKee family. The first manse had been in Princes Street in the town. Mr. McKee died on 7th December 1877 and was succeeded on 31stMay 1878 by the Rev. James Rentoul formerly of Clough, Co. Antrim. He died after a long ministry on 2nd January 1917. The next minister called was Mr. William John McMullan (lic. Rathfriland), ordained on 1 Mar. 1917. He saw some service as a Chaplain in World War I, but he was killed in a road accident on 30th January1920, aged 28, after he had been demobilized. He was followed by Mr. George Francis McQuitty (lic. Ballymena) who was installed on 27th May 1920. He was called to First Newtownards and resigned on 4th November 1924. The congregation then called Rev. William Bates of Grange and he was installed on 26th March 1925. He remained five years, resigned on 24th June 1930 when called to Faughanvale. The Rev. Thomas Bole of Sixmilecross was installed on 20th November 1930, but after only eighteen months he removed to Donore, Dublin, on 5th May 1932. During his short ministry the Church Hall was built on ground purchased by Rev. James Rentoul. A Ballymena licentiate, Mr. Herbert Mulholland, was his successor. Ordained on 29th September 1932, he was later to resign on 25th October 1945 when called by the Moseley Presbyterian congregation in Birmingham. Then on 4th April 1946 Mr. Hugh Robert Cecil Moore (lic. Belfast) was ordained and many structural improvements have taken place in his time. The meeting-house was completely renovated in 1954. A Minor Hall was added in 1961 and the Church Hall was extended in 1970. Mr. Moore retired in 1984 and died on 14th January 1999. Mr. Moore’s successor, the Rev. Alex William Boyd was installed in March 1985 and resigned in February 1998 when called to Ballyhenry. The present minister, the Rev. Gary Trueman, formerly of 2nd and 3rd Rathfriland, was installed in Banbridge Road Presbyterian Church in October 1998. During his ministry major renovations were carried out and a new hall complex was opened in June 2003. The Rev Scott Martin, Minister Emeritus of Anahilt and Drumlough, retired from the united charge in March 1997. He was appointed Pastoral Assistant at Banbridge Road in October 1999 and left at the end of August 2006. Raymond McKibben, a second year ministry student at Union Theological College in Belfast, has been Summer Assistant at Banbridge Road since the middle of June and will leave on Sunday 17th September to continue his studies. 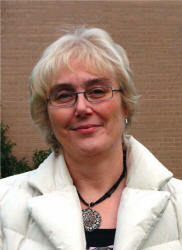 Dr Lena Morrow, a member of Kilmakee Presbyterian Church (Dunmurry) was appointed Pastoral Assistant at Banbridge Road in January 2007. A medical doctor by profession, Lena and her husband Merrill were missionaries with Interserve in the Middle East from 1987 to 1994 and since 1995 Lena has worked at Belfast Bible College where her duties included Director of Spiritual Development, Tutor and Student Counsellor. In October 1836 a deputation of about 25 local people approached the Secession Synod requesting that a second Presbyterian church be established in the town of Dromore. This was granted and services were initially held in the Court House. In December, use of the Court House was discontinued and it would seem that the Reformed Presbyterians (Covenanters), who held services on occasions in a hall in the town, accommodated the new congregation. The united Church body decided to proceed with the idea of a separate congregation. In August 1838 work commenced on the present church building. Money was not forthcoming and progress was slow. The Presbytery had to come to the rescue and by 1841 the church had been built. In March 1843, the Rev John McKee was ordained and installed as the first minister of the congregation of Second Dromore as it was then known. In the early years of his ministry Mr McKee lived in a house in Princes Street, now No. 17. In those days it was a detached house but later it became part of the terrace. In 1850, a manse was built at Ballymacormick on land owned by the McKee family. During the short ministry of the Rev Thomas Bole (1930-1932), a church hall was built. During the ministry of the Rev Hugh Moore, (1946-1984) the Church was completely renovated in 1954, a Minor Hall was added in 1961 and the Church Hall was extended in 1970. In March 1984 building work commenced on the present manse and it was ready by the time the Rev Alec Boyd was installed. During Mr Boyd’s ministry (1985-1998) the Church was re-roofed, rewired, recarpeted, pews upholstered and a PA system installed. The present minister, the Rev Gary Trueman, was installed in October 1998 and during his ministry major renovations have been carried out and a new hall complex opened in June 2003. The Rev Scott Martin, Minister Emeritus of Anahilt and Drumlough, retired from the united charge in March 1997. He was appointed Pastoral Assistant at Banbridge Road in October 1999 and left at the end of August 2006. Raymond McKibben, a second year ministry student at Union Theological College, was appointed Summer Assistant in June and left on Sunday 17th September 2006 to continue his studies. This article was compiled largely with the assistance of Dr Robin Coulter, a former member of Banbridge Road Presbyterian Church, now living in Lisburn. Much of the information was taken from the Rev Hugh Moore’s book entitled, ‘Banbridge Road Presbyterian Church Dromore – A Place of Worship’. To see the book online, go to the ‘Books’ section of www.lisburn.com and click on: Banbridge Road Presbyterian Church Dromore. ' A Place of Worship' .